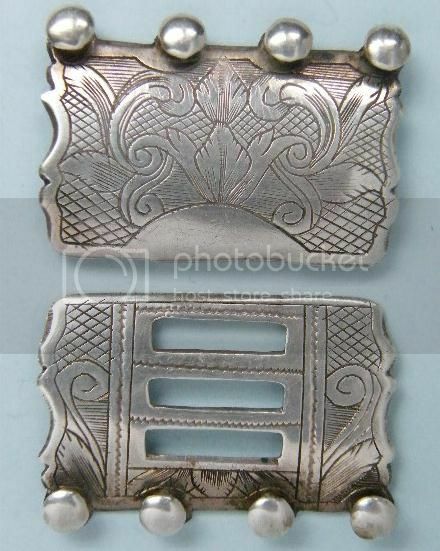 An exceedingly rare stock clasp came up in auction recently in Canada. Modesty prohibits me from naming the buyer, except to say my wife has now, almost, forgiven me for the cost ! Marks are only the Lion Passant of London 1740-1756 and the maker's, which is unrecorded as far as I can tell. The rebus is, I think, a cup and cover. The Golden Cup was a quite common shop sign and address for goldsmiths in this period , but not recorded to any I A one as far as I know . However two intrepid heroes of 925 are currently searching for the Golden Cup ! My own thought is perhaps John Andrews of Brick Lane. Probably wishful thinking. Size is 44mm by 52 mm. A suspect for the maker's mark has emerged ! Grimwade, page 421, gives a John Alcock who was apprenticed to Daniel Skinner on 12 September 1717 and made free 1724.He recorded a mark as small worker in 1725 at Wood Street. Daniel Skinner had been an apprentice of Maurice Boheme , a well known bucklemaker . Alcock in turn took as apprentice Henry Bickerton, also later a known bucklemaker , so there is every likelihood that Alcock was one . Grimwade also refers to Philip Shaw who in 1730 was “Living with Mr Alcock , Goldsmith at ye Cup and Ring at Cripplegate (see John Alcock ) “ . The Cup and Ring was obviously the shop sign and very likely the rebus on this mark . The north end of Wood Street is in the Cripplegate area. A trial at the Old Bailey refers to the theft by three men of three pair of silver Stock-clasps, a silver Tobacco-stopper, and half a silver Stock-buckle, plus two pair of silver Tea-tongs, Three silver Girdle-buckles, eleven Tea-spoons and half a silver Stock-buckle (the other half ? ), the Goods of John Alcock, in his Shop . John Alcock stated “These Goods were lost out of my Shew-glass, ….the Prisoners had stolen all these Things out of my Shop at Cripple-gate “ . "The Prisoner lived with me a Year and an half; she was discharged my Service the 31st Day of August last. The 29 year tenure by 1747 of this John Alcock regrettably is inconsistent with the John Alcock who was apprentice to Daniel Skinner at Silver Street until 1724. 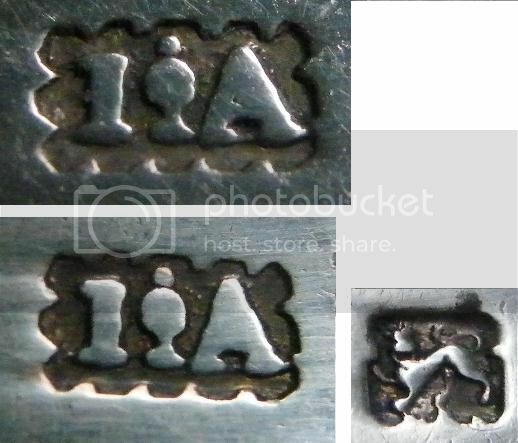 We may have two silver bucklemakers of the same name and period ! Or the trial account report may have been mistaken ! The Proceedings of the Old Bailey were not official reports , but somewhat sensationalist journalism.